Today is the second World Day of the Poor, with the theme of “This poor man cried, and the Lord heard him”. 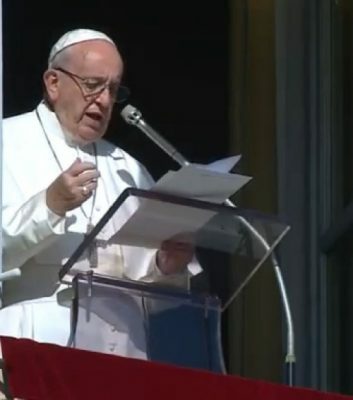 In his message for today, Pope Francis highlighted two verbs – cry and hear. To hear their voice, what we need is the silence of people who are prepared to listen, the Pope continued. “At times I fear that many initiatives, meritorious and necessary in themselves, are meant more to satisfy those who undertake them than to respond to the real cry of the poor. We are so trapped in a culture that induces us to look in the mirror and pamper ourselves, that we think that an altruistic gesture is enough, without the need to get directly involved. It cannot be limited to a “kind of social assistance”, as Evangelii Gaudium says concern for them requires a “loving attentiveness” that honours the person as such and seeks out his or her best interests. Poor people identify with Bartimaeus in the Gospel, said Pope Francis. “How many people today feel in the same situation! Lack of basic means of subsistence, marginalisation due to a reduced capacity for work, various forms of social enslavement, despite all our human progress. “They are waiting for someone to come up to them and say, ‘Take heart; rise, he is calling you’, but sadly often experience the exact opposite. We tend to create a distance between them [the poor] and us, without realising that in this way we are distancing ourselves from the Lord Jesus. While working with other agencies was to be welcomed, said Pope Francis, Christians should not downplay their specific role – which is to lead everyone to God. He urged all Christians to honour the poor. “Far be it from Christ’s disciples to nurture feelings of disdain or pity towards the poor. Instead, we are called to honour the poor and to give them precedence, out of the conviction that they are a true presence of Jesus in our midst. ‘As you did it to one of the least of these my brethren, you did it to me’ (Matthew 25:40).